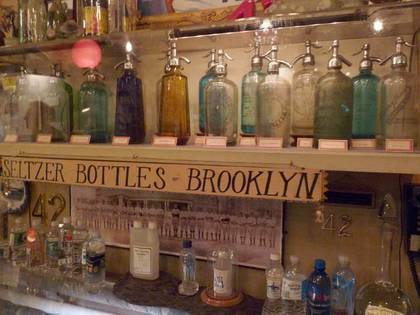 A treasure trove of NYC memorabilia in Williamsburg. 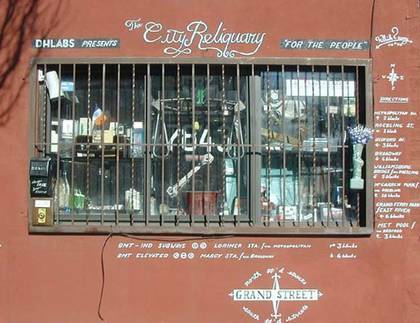 I’ve been a big fan of The City Reliquary, a museum and civic organization located in a storefront at 370 Metropolitan Avenue off Havemeyer Street, since I first encountered it in February 2004. You enter (after handing over a donation) through a subway turnstile and step into a wonderland of New York City memorabilia, with wall displays and cabinets of curiosities that include thousands of found and donated objects, such as subway nameplates and station signs, as well as permanent exhibits such as a collection of Statue of Liberty postcards and figurines, collections of seltzer bottles, a tribute wall to the Brooklyn Dodgers and Jackie Robinson, and temporary exhibits dedicated to things like NYC lampposts and the mashed potato and pastry treat the knish—more on those a bit later. Kindred spirits in Forgottenhood are always a blessing in NYC. I’m always glad to find someone whose interest in NYC's hard-to-find corners matches my own. The City Reliquary was founded by transplanted Floridian and firefighter Dave Herman, whose streetside collection of NYC artifacts began to attract attention in 2002. On a frigid 15 degree day in February 2004, I and fellow Forgotten NY fan Vinny Losinno decided to check it out after I read a short blurb about it in Time Out New York. Dave's diorama started to take shape when he, with the indulgence of his landlord, painted directions to local Williamsburg attractions on his building. The nearest subway station, Lorimer Street, is a couple of blocks away and is a transfer point, and he noticed that some people, drawn by Williamsburg's nightlife and daytime shops, were passing by needing directions. Originally an artist by trade, Dave decided to combine his talent for creating sculptural installations with his appreciation for NYC history in this exhibit. 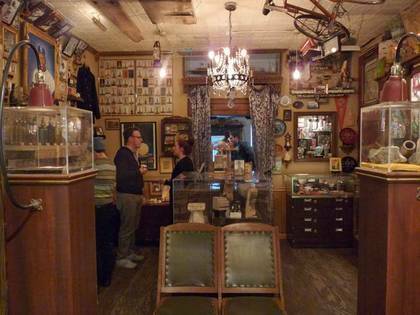 Using a former corner storefront with glass display cases on two sides, Dave's artifacts were protected behind window guards. A taped message detailing the collection could be played by pushing a button. • A number of things Dave found washed up on the shore of Dead Horse Bay, an inlet just west of Floyd Bennett Field at the end of Flatbush Avenue in a region once known as Barren Island, that was renowned for its stench emanating from its equine-rendering glue factories. The collection includes a bottle of rubber cement; a 1954 calendar; a traditional hourglass-shaped Coke bottle; a bottle of Major's Rubber Cement; a container once holding what appears to be "Timba Dapper" cologne; and a set of false choppers. • A souvenir coin distributed on the Brooklyn Bridge's opening day, May 24, 1883. • Metalwork salvaged after the Williamsburg Bridge's extensive renovations, begun in the 1980s and still ongoing. • A rope that held the mourning drape on the City Hall balcony following the attacks of 9/11. Dave also has a tattered flag that flew at a BQE construction site in the weeks following 9/11. • Soil taken from a small island in New York Bay close to New Jersey. Originally known to the Mohegan Indians as Minnissais (Lesser Island), it has also been known as Great Oyster Island and Bedlow's Island (for a former owner, Isaak Bedloo). It has been a smallpox quarantine station and the home of Fort Wood, upon whose foundation Auguste Bartholdi would assemble Liberty Enlightening the World after lengthy negotiation and preparation; he had the idea for the statue as early as 1871. The Statue of Liberty, a gift from the French government, was originally meant to commemorate America's 1876 centennial. The statue serves as the Reliquary’s unofficial mascot and a wall section is dedicated to SOL postcards. While Vinny and I chatted with Dave, teeth chattering in the cold, Dave’s building’s super, Juan, emerged and pointed to something that looked promising in the garbage on the sidewalk outside the Reliquary. We reached in and found gold: an publicity photo of longtime Yankee third baseman Graig Nettles, signed by “Puff” himself! Looked like the Reliquary was ripe for another addition. Teeth chattering, or sweating outdoors in the warm months peering into the corner window, ended in 2006 when Herman, with the aid of like-minded enthusiasts, formed a nonprofit and was able to obtain funds to rent a storefront at nearby 370 Metropolitan, where they've been located ever since. The Reliquary has grown to become not only a museum but a neighborhood focal point and community center, with annual events such as Bicycle Fetish Day, a July block party celebrating bicycles and their riders, and Collectors’ Night, held in April, when the Reliquary invites local collectors with interesting objects for a night of show-and-tell. The Reliquary sponsors the annual Panorama challenge, run by tourguides Levy’s Unique New York, a New York City geography quiz held at the New York City Panorama. In the interest of full disclosure, my team won the very first Panorama Challenge in 2007, after which I was banned—but I do appear as a “celebrity judge” every year. 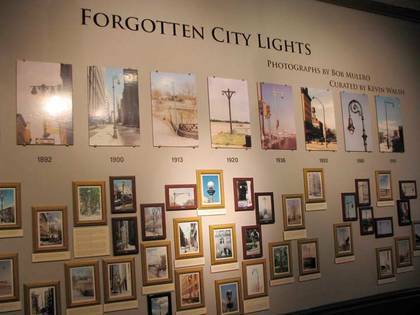 In the summer of 2010, I was immensely happy to be able to mount an exhibit at the Reliquary that I put together with Robert Mulero, who has hundreds of photos of New York City lampposts going back to when he first began photographing them in 1978. As you can see, the Reliquary went all-out with an entire room dedicated to lampposts, with excellent lighting, labelling, and framing. The back room is also given over to wall exhibits, but is also a space for film screenings and live presentations. The illuminated neon sign on the wall was located at the 2nd Avenue Deli in its original 2nd Avenue and 10th Street location; it closed after owner Abe Lebewohl was gunned down in a robbery, but has since reopened in two locations, one on 1st Avenue and the other on East 33rd Street. 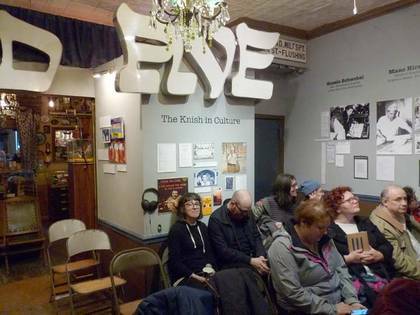 I visited the Reliquary last week to take in a screening of If These Knishes Could Talk, an examination of the New York City accent produced by my friend Heather Quinlan. Various everymen and everywomen, as well as comics Pat Cooper and Penny Marshall and journalist Pete Hamill, talk about the distinctive NYC manner of speaking; one thing you learn from a linguist Heather interviewed is that there is no such thing as a “Brooklyn” or “Bronx” NYC accent, but there are variations based on ethnicity; Italian, Irish, and Jewish NYC accents are the most prominent. The uniquely NYC treat, the knish, is also examined in the film and serves as a parallelism since the food, and the accent, are closely identified with New York City and environs. 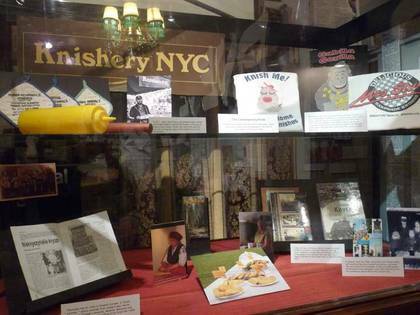 The Reliquary, meanwhile, mounted a knish exhibit with its general bonhomie and aplomb. Visit the City Reliquary Thursdays, Fridays, and Sundays from 12pm to 6pm, and on Saturdays from 12pm to 8pm.